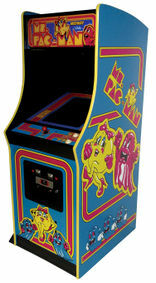 Example of a Ms. Pac-Man arcade cabinet. Arcades were venues in which many games were played at, often containing thousands of games. Arcades often got their revenue from players who paid to play games. Most arcade emulators focus on emulating many systems in one program, the scope of which varies between projects. Machines often varied by their design and, unlike consoles, were often tailored to just one game. Games were designed to eat as many quarters as possible, which is emulated with the "Coin" key. Some games have a service mode (mapped to F2 in MAME) with menus meant for the arcade owner to set dipswitches for difficulty, censorship, language, and most importantly a "Free Play" mode that allows players to continue as many as they want without requesting more coins. Sometimes, similar menus meant for developers (labeled debug or test usually, sometimes requiring a developer BIOS like with some Neo Geo games) are left in the game too. Hardware made specifically for the arcade to provide for graphics and performance unseen on home consoles. Extremely common in the golden age of arcades but became much less frequent as companies used modified existing hardware instead to save on R&D costs and easier cross-platform development, or tried to differentiate between the home and arcade experience with control scheme gimmicks instead. MAME's purpose is to cover most of these. Older arcades as well as select popular arcade machines, the Neo Geo and Capcom's CPS series, in particular, received their own standalone emulators. Sometimes, they received their own console versions but those are mostly ports, not emulation, with very few exceptions. Those arcade boards share most of the hardware specifications with existing home consoles, with the addition of a coin slot and occasionally DRM and some changes. While MAME supports most of those, standalone emulators for the base home console are more mature and often (but not always) support the arcade variants. Based on normal PC architecture with a variation of Windows 7 Embedded or Linux installed and tons of DRM and custom drivers. These can still be run on computers using the right launchers (Game loader All RH, SpiceTools, idmacx tools, TekParrot...) but most likely won't be emulated by MAME anytime soon, and not just because of their policies on what hardware is too recently commercialized to cover. Microsoft Visual C++ Runtimes: A one-in-all link for all editions from 2005 to 2015 may be found here. Microsoft .NET Frameworks: Any version from 1.0 to 4.5 may be required, the newer, the better. Microsoft DirectX 9.0: Offline installer here. PC Video Codecs: Grabbing the standard K Lite Codec pack from here is recommended. Remember to backup data from the downloaded scene release before trying to fix it to run. iDmacDrv32.dll: Needed in Nesica games. If present, do not delete it, copy Jconfig.exe and the replacement iDmacDrv32.dll from the Jconfig package, then double-click NesicaXlive.reg to import keys to your registry, and use the game executable to run the game. If not present, copy Jconfig.exe, JVSemu.dll, and jvs_loader.exe from the Jconfig package, and use jvs_loader.exe to run the game. Save Fixes: Some games can't save scores and data at all. For a bunch of machines, there are fixes (called "loaders pack") that enable that, but some machines (nesica) handle saving purely using official servers in which case there's not much (yet) to do about it. Extra Fixes: Varies per game. Check the readme with the game scene release. You can set your controls in Jconfig.exe, and it's recommended to disable Dsound and D3D Wrapper. Some games can have DirectX related problems. For some, deleting the existing d3d9.dll or opengl.dll files can help. For others, they expect the older D3D8 codec and have bugs (crashes, uneven speed) that can be fixed with Reshade's d3d8to9 plugin. ↑ Open-Source DAPHNE - new fork with an open-source frontend for 64-bit Linux. ↑ OpenParrot - new open-source core distinct from TeknoParrot. ↑ Generate cache with included romcnv utility. ↑ Only available on mobile as a libretro core (e.g. RetroArch). Very extensive in scope, with the majority of arcade system boards from the 1970's, 1980's and early 1990's supported. Do not expect support for more recent boards, such as Atomiswave. MAME focuses on accuracy and preservation, meaning usability comes second for the end user. Only the most up to date ROM dumps will work in the latest MAME. Supports many boards, such as Neo Geo, Capcom CPS1-3, and others. It is very good for the boards it supports. The Neo Geo X system, in fact, uses FBA. It offers much better speeds on lower-end hardware than MAME and has been ported to many different devices, such as PlayStation 3, Xbox, Xbox 360, Sega Saturn, Android, Wii, Dingoo, and many others. Emulates old arcade machines from the early 1970's at a very high level of accuracy. Since these machines had no CPU, the emulator instead emulates discrete logic components in the circuit board. This method is very system-intensive, and getting full speed requires at least a mid-range gaming PC along with the 64-bit version of the emulator. Emulates Sega's Model 3 arcade platform focusing on accuracy. Presently, Supermodel is in a very early "alpha" stage of development, meaning it lacks many planned features. It does not yet have a user-friendly graphical interface, and all CPUs are emulated using straightforward (and slow) interpretation rather than fast just-in-time translation. Game compatibility is quite good. It has an experimental multi-player network build. Emulates, as per its name, Sega's Model 2 arcade platform with a focus on speed over accuracy. Despite this, however, it still manages to play games for that hardware with far higher accuracy than MAME currently can. Emulates Sega, Namco, Capcom and Tecmo arcade games, in addition to Neo Geo. It is a viable method for official emulation, but forces you to play like you would on a real arcade machine. This page was last edited on 19 April 2019, at 15:08.